This article is part 4 of our Thread Dump analysis series which will provide you with an overview of what is a JVM Thread Dump for the IBM VM and the different Threads and data points that you will find. As you will see and learn, the IBM VM Thread Dump format is different but provides even more out-of-the-box troubleshooting data. At this point, you should know how Threads interact with the Java EE container and what a Thread Dump is. Before we go any further in the deep dive analysis patterns, you also need to understand the IBM VM Thread Dump format since this is the typical Thread Dump data to expect when using IBM WAS on IBM VM. As you can, there are extra runtime data that you will not find from a HotSpot VM Thread Dump. Please keep in mind that you may not need to review all these data points but you still need to understand what data is available depending of your problem case. The rest of the article will cover each Thread Dump portion in more detail. The first portion provides you with detail on how this Thread Dump was generated. IBM Thread Dump can be generated as a result of a “signal 3” or “user” e.g. kill -3 <Java pid> or automatically as a result of severe JVM conditions such as an OutOfMemoryError. This section is very useful as it provides you with a full view on your JRE major version and patch level along with all JVM start-up arguments. This section provides you with a listing of current user and environment variables such as File Descriptor limit. 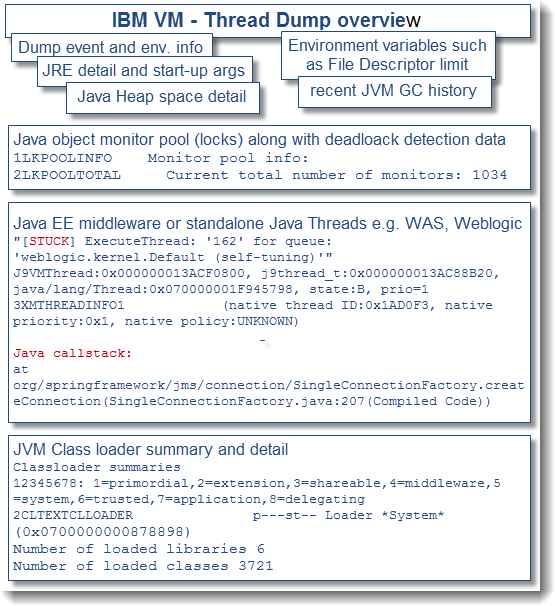 Similar to HotSpot VM 1.6+, IBM VM Thread Dump also contains information on the Java Heap capacity and utilization along with memory segments allocated for each memory space of the Java process. Please keep in mind that deeper Java Heap analysis will require you to analyze the Heap Dump binary snapshot as per below tutorial. Finally, a history of the garbage collection process is also present. This Thread Dump portion is very important. Quite often Thread problems involve Threads waiting between each other due to locks on particular Object monitors e.g. Thread B waiting to acquire a lock on Object monitor held by Thread A. Deadlock conditions can also be triggered from time to time; especially for non-Thread safe implementations. The IBM VM Thread Dump provides a separate section where you can analyze lock(s) held by each Thread including waiting chain(s) e.g. Many Threads waiting to acquire the same Object monitor lock. Similar to the HotSpot VM Thread Dump format, this portion is the core of the Thread Dump and where you will typically spend most of your analysis time. The number of Threads found will depend on your middleware software that you use, third party libraries (that might have its own Threads) and your application (if creating any custom Thread, which is generally not a best practice). The following Thread in the example below is in BLOCK state which typically means it is waiting to acquire a lock on an Object monitor. You will need to search in the earlier section and determine which Thread is holding the lock so you can pinpoint the root cause. Finally, the last section of the IBM VM Thread Dump provides you with a detailed class loader summary. This is very crucial data when dealing with Class Loader related issues and leaks. You will find the number and type of loaded Classes for each active Class loader in the running JVM. I suggest that you review the following case study for a complete tutorial on how to pinpoint root cause for this type of issues when using IBM VM. I hope this article has helped to understand the basic view of an IBM VM Thread Dump. The next article (part 5) will provide you with a tutorial on how to analyze a JVM Thread Dump via a step by step tutorial and technique I have used over the last 10 years. Please feel free to post any comment and question.